A cosmic display of "shooting stars" will light up the night skies this week during the annual Perseid meteor shower, when up to 200 meteors per hour will hit the Earth's atmosphere and disintegrate in flashes of light, according to NASA. 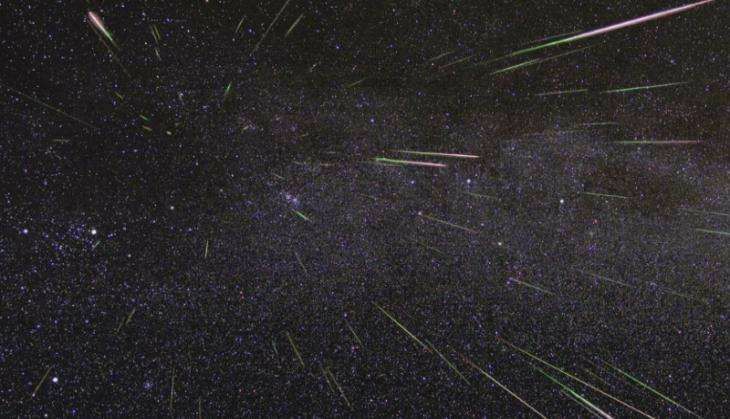 "Forecasters are predicting a Perseid outburst this year with double normal rates on the night of August 11-12," said Bill Cooke from NASA's Meteoroid Environments Office in the US. The Perseids show up every year in August when Earth ventures through trails of debris left behind by an ancient comet. This year, Earth may be in for a closer encounter than usual with the comet trails that result in meteor shower, setting the stage for a spectacular display. "Under perfect conditions, rates could soar to 200 meteors per hour," said Cooke. Every Perseid meteor is a tiny piece of the comet Swift-Tuttle, which orbits the Sun every 133 years. Each swing through the inner solar system can leave trillions of small particles in its wake. When Earth crosses paths with Swift-Tuttle's debris, specks of comet-stuff hit Earth's atmosphere and disintegrate in flashes of light. These meteors are called Perseids because they seem to fly out of the constellation Perseus. Most years, Earth might graze the edge of Swift-Tuttle's debris stream, where there is less activity. Occasionally, Jupiter's gravity tugs the huge network of dust trails closer, and Earth ploughs through closer to the middle, where there is more material. This may be one of those years, NASA said. Experts agree that three or more streams are on a collision course with Earth. "The meteors you'll see this year are from comet flybys that occurred hundreds if not thousands of years ago," said Cooke. "They have travelled billions of miles before their kamikaze run into Earth's atmosphere," he said. The best way to see the Perseids is to go outside between midnight and dawn on the morning of August 12. "Allow about 45 minutes for your eyes to adjust to the dark. Lie on your back and look straight up. Increased activity may also be seen on August 12-13," NASA said. Perseid meteors travel at the blistering speed of 59 kilometres per second. At that speed, even a smidgen of dust makes a vivid streak of light when it collides with Earth's atmosphere. Peak temperatures can reach anywhere from 1,600 to 5,500 degrees Celsius as they speed across the sky. The Perseids pose no danger to Earth. Most burn up 80 km above our planet. However, an outburst could mean trouble for spacecraft.